In 1956, the Detroit Transmission Division introduced the second-generation Model 315 Controlled Coupling Hydra-Matic, which by the end of the model year had replaced the Dual-Range Hydra-Matic on most of GM’s passenger car lines (though not on trucks). The new Hydra-Matic applied the split torque principle not once, but twice. As we’ve discussed in a previous article, the second-generation Hydra-Matic was designed to be smoother in operation than the older single-coupling transmissions, which had been notorious for their firm shifts. One of the many changes to the new transmission was the replacement of the front clutch with a second, smaller fluid coupling, controlled by alternately draining and refilling its oil supply. Just like the multi-disc friction clutch it replaced, the controlled coupling was disengaged (which in this case meant empty) in first and third and engaged (i.e., full) in second and fourth. 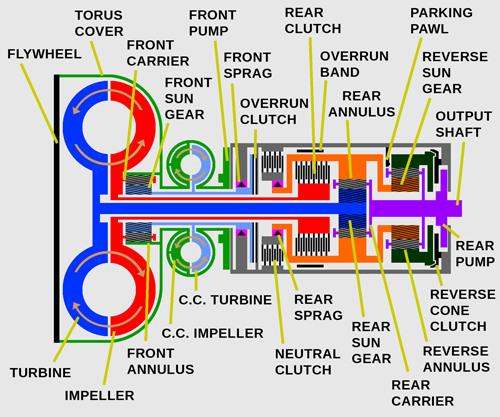 In dual-coupling Hydra-Matics, the torus cover of the main coupling was bolted to the flywheel, just as in the single-coupling transmissions, and drove the the annulus of the front planetary gearset. The torus cover also drove the torus cover of the small controlled coupling, so the controlled coupling’s impeller rotated at engine speed even when the coupling was empty. The controlled coupling turbine was affixed to the front unit sun gear (or, to be very technical, the sleeve shaft connecting the sun gear to the front sprag and overrun clutch). When the small coupling was full, engine torque was transmitted through the coupling to the sun gear, driving it forward. This creates what you’ll hopefully now recognize as a “series parallel” split torque arrangement in second and fourth. In those gears, engine torque was divided between the mechanically driven front annulus and the hydraulically driven front sun gear. The front carrier, which was mounted on the back of the main coupling impeller, resolved the speed difference between those gears and applied their combined torque to the main impeller and the intermediate shaft. The front annulus of a Controlled Coupling Hydra-Matic had 56 teeth while the front sun gear had 31 teeth. With the annulus driving, that gave the front gearset a ratio of 1.55:1 (1 + 31/56). If both the annulus and sun gear drove, the sun gear received about 35.6% of engine torque while the other 64.4% was applied to the annulus. This split served to demultiply any slip in the controlled coupling by 64.4% in the manner we described on the previous page. For example, if the controlled coupling had an efficiency of 97% at cruising speed, the demultiplication effect would reduce effective slip from 3% at the turbine to a little less than 1.1% at the carrier. Discounting mechanical losses, that would mean the front carrier and impeller rotated at about 98.9% of engine speed. 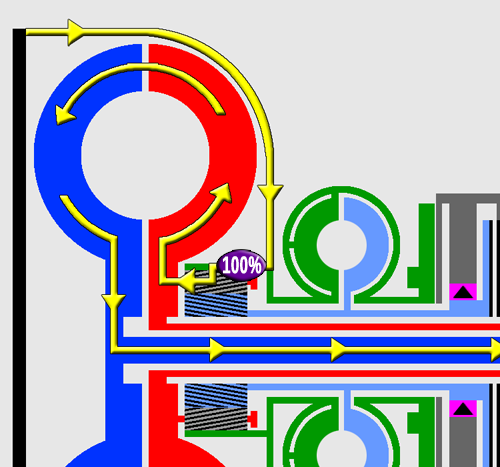 In first and third, when the small coupling was empty, the controlled coupling turbine did not rotate, so all engine torque flowed through the annulus. That torque and the inertia of the front carrier and impeller exerted reaction torque on the front sun gear, locking the front sprags (which kept the sun gear from turning backward) and driving the carrier and the main coupling impeller forward at 64.4% (100% / 1.55) of engine speed. Like the single-coupling Hydra-Matic, the Controlled Coupling Hydra-Matic had an intermediate shaft that mechanically connected the main coupling impeller to the rear clutch hub. In third and fourth, when the rear clutch was engaged, torque on the main impeller was split between the mechanically driven rear annulus and the hydraulically driven rear sun gear. The rear annulus of the dual-coupling Hydra-Matic had 73 teeth and the rear sun gear had 47 teeth, so with the sun gear driving, the rear gearset had a ratio of 2.55:1 (1 + 73/47). That exerted reaction torque on the annulus at a ratio of -1.55:1 (0 – 73/47). Therefore, the rear annulus had to receive 1.55 times as much torque as the rear sun gear did, giving a torque split of 60.8%/39.2%. This served to demultiply slip in the main coupling by 60.8%. Like the single-coupling Hydra-Matic, fourth gear in the dual-coupling transmission was direct drive, which meant that the controlled coupling was full and the rear clutch was engaged in top gear. That wasn’t ideal from the standpoint of efficiency because it meant that in fourth, power had to flow through both couplings rather than just one. As illustrated above, if we assume the controlled coupling was 97% efficient at cruising speed, the speed of the impeller and intermediate shaft (discounting mechanical losses) would be 98.9% of engine speed. If we assume the efficiency of the main coupling at cruising speed was also 97%, the speed of the turbine and the main shaft, again discounting mechanical losses, would be just under 96% (98.9% * 97%). Net slip at the output shaft, therefore, would be 2.23%, which would be less than the slippage in either coupling, albeit still more than in a single-coupling Hydra-Matic. Detroit Transmission Division was concerned enough about the additional slippage that they considered adding a lockup clutch for the controlled coupling, allowing it to be completely locked out when cruising in fourth. However, that feature wasn’t adopted for production, perhaps because the double demultiplication effect made the Controlled Coupling Hydra-Matic at least as efficient with two couplings as many other contemporary automatic transmissions were with only one. In any case, the second-generation Hydra-Matic was intended for big American cars with big V-8 engines and curb weights often exceeding 4,400 lb/2,000 kg, so a small amount of additional hydraulic slippage was not considered a deal-breaker. Well Aaron . . another masterpiece. This and the GM automatic history are probably the most definitive descriptions of these technologies on the Internet, excepting pure design and engineering treatises. Well done and thank you; this must have been an enormous amount of work. I have yet to read this monumental work in depth. Whether it will add to my working knowledge is debatable, but my brain will benefit from the workout. I can’t imagine the hours of work which you must have put into understanding these various transmissions, to say nothing of writing up a description that a simpleton like me could (mostly) understand. Another fascinating article, thank you for all your effort! One thing I’ve always wondered about was if any manufacturers looked into Wilson pre-selector gearboxes as a basis of an automatic. Wilson pre-selectors were pretty well established technology, although not common, by the late ‘30s. Obviously some sort of mechanism would have been required to determine what gear to select and when to actually shift, but starting with a Wilson ‘box at least some of the problems would have been solved. But I’ve never heard of anyone going that route. The GM team that designed Hydra-Matic was certainly familiar with the Wilson preselector. In fact, Cadillac’s chief engineer ordered an early Daimler Double Six with the Wilson and Laurence Pomeroy’s Fluid Flywheel for evaluation purposes. However, Wilson gearboxes were quite bulky and complex because the nature of their operation required a separate set of epicyclic gears for each ratio, including reverse. With automated hydraulic operation and combinations of brakes and clutches, it was possible to get the same results more efficiently. I haven’t studied the Wilson preselectors in any great detail, but if you’re curious, the applicable U.S. patents are US1404675 and US1796904. As you’ll see if you look at the first one, the original iteration had three speeds forward and one reverse, for which it requires four epicyclic gearsets. A Simpson gearset (which I’ll be discussing in great detail in the next few days) provides the same number of ratios from only two gearsets, and a single Ravigneaux gearset can give you four forward speeds and reverse if you have enough clutches. So, you can see how those would be preferred from a standpoint of cost and packaging! For comparison, a four-speed Wilson pre-selector has four planetary gearsets, four sets of brake bands, and a cone clutch, which is a lot of pieces.